Support for Zouk has come from all over, not just in Singapore. 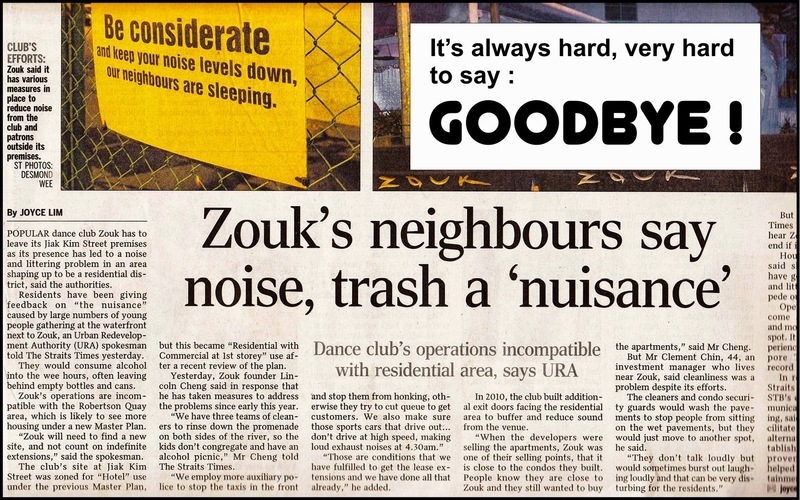 Facing the possibility of closure, loyal fans and friends in the entertainment circle gathered around Lincoln Cheng to show support for his quest to extend the lease of Zouk for another three years. URA seems adamant that the land must be free up. All possible grounds have been dug up to challenge URA's decision including Zouk's remarkable reputation as a tourism icon, and prominent destination for revellers. Petitions are gathering and Facebook accounts were set up determined to stop URA from repossessing the land for which Zouk is sitting on upon the expiry of the lease. It was only a short while ago another iconic destination, Indochine was also given the "red card", but generated less buzz. About the same time, famous ventriloquist Victor Khoo passed away after a fight with cancer. It is always very hard to say goodbye. I accompanied my neighbour, a good friend, and team mate of the same football team to visit his sick mother in hospital, decades ago. It was my first encounter with someone dying. Family members were gathered around by the bedside and some were visibly weeping. The concentration of plea and refusal was so intense in a fight to resist the forces of the angel of death. The feeling of death is nearing overwhelmed me and I found myself repeating in my head "God please don't let her die". The fight was all over when loud screaming was heard. Fighting against death is not unique, nor exclusive. We fear the void left behind when a relationship suddenly evaporates. At times it seems so silly, with things that have no life so to speak, and money can buy. A computer, a pair of shoes, a car, or just about anything. These things were part of our memories, were there when at unforgettable moment happened, helped made those moments so precious, and had been constant companion through good and bad times. When the window closes, we sometimes deny it from happening. We kept the broken down things hoping for a miraculous resurrection to happen. Yes we can choose to do that, and long enough they probably find life again in the vintage world. We can also look at it differently. Instead of mounting a fight against death, which may incur pain and discomfort to the dying, a better way can be to make the departure less painful. Let the dying be assured that he or she has already accomplished all that he or she needs to do. Let it be known that there is nothing worth worrying and all will be well taken care of thereafter. Let the dying go in PEACE. When the window closes on one life, another opens to a brand new world. The things we had were great friends and companions. Victor Khoo addressed his puppet Charlee "business partner". When Victor Khoo departed recently, Charlee lost a business partner and a friend. But the glorious partnership will be well remembered. They were once there, but they have to go now.